The proverb says that “All good things come to those that wait”, however at Motiv8, our belief is that you can dream about your goals all you want, but you wont ever reach them if you don’t do anything to achieve them. So when we received the pitch document from Ford for the launch of their new SUV, we decided to truly embrace the brands “Unlearn” advertising campaign and not only propose an event different to anything they had seen before, but pitch it to them in an unusual and different way. Exact details of how Steve, David and Katie bought the Motiv8 way to life in a presentation are as closely guarded a secret as the KFC recipe. However it must have worked because Motiv8 were selected to design and deliver the first ever ‘Ford Live’ event. How we pulled off the most exciting event for Ford in years is no secret however, and this blog tells the tale of a truly memorable event. Millbrook Proving Ground was our choice as the facility to host the event. We have a long and trusted relationship with this amazing venue, and the infrastructure here would enable us to design innovative, dynamic and creative sessions. Combine these with the fantastic Motiv8 team and we knew that we had the perfect foundations for an amazing event. But if there is one thing the Motiv8 team can do, it is deliver on their promises, and as soon as the first delegates arrived to the concept of a ‘staggered start’ and a short video opening as opposed to hanging around for ages for an elaborate and sometimes unnecessary opening presentation, they knew they were in for something different. And something different is a perfect way to describe our Brand Ambassadors, who led the groups of delegates on their learning journey throughout their day. Our BA’s were chosen for their enthusiasm, energy and people skills and my goodness did they deliver, ensuring that delegates were fully engaged and focussed throughout the day and most importantly making sure they were in the right place at the right time. After all, on an event like this, timing is critical! To create different learning experiences, we had to design truly innovative and engaging sessions which would allow delegates to experience the vehicle first-hand in an environment that encouraged learning. So how did we do that? The ‘Design Zone’ run by Paul O’Neill focussed on the fantastic exterior styling through an exciting walk around of the vehicle. Also in this session our Brand Ambassadors facilitated a session to show off a variety of accessories available on the Ford Edge. Last but by no means least, delegates were able to experience the interior features of the vehicle by driving it around the high-octane 5-Lane high-speed bowl circuit at Millbrook with star pairing, Chris Dredge and Ashley Dibden at the front and rear of the convoy – talk about a thrilling session! 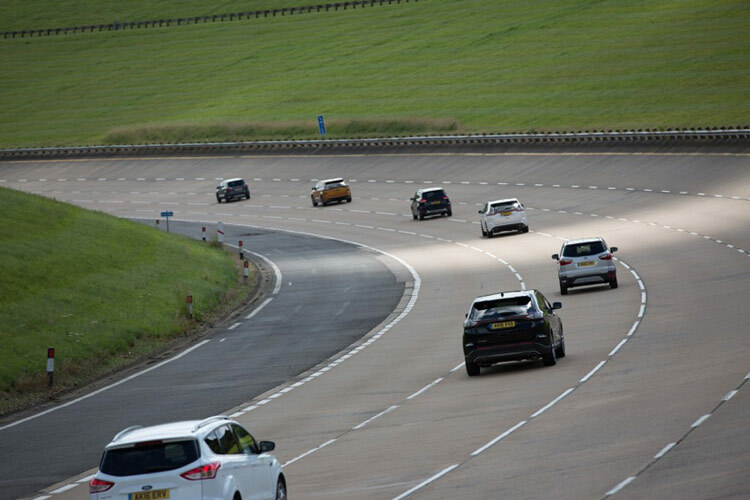 The ‘Challenger Zone’ consisted of two mini sessions, exploring the entire range of the new Ford Edge, as well as analysing static competitor vehicles, led by our dynamic duo of Alex Dew and Laura Neil. These sessions allowed a unique, very hands-on experience assessing the specifications and core strengths of the Edge against its rivals. The ‘Off-Road Zone’ was two experiences for the price of one. Firstly the delegates experienced first hand the all-wheel drive system of the new Ford Edge on an off-road route not for the faint-hearted, guided every step of the way by Lee Walker and the team and you can’t get more hands on than driving the vehicle off the edge of a 25 degree incline! The second half of the Off-Road Zone involved Motiv8’s resident boffin James “No lab coat required” Morton, facilitating a series of work-station ‘experiments’ that allowed delegates to understand the inner workings of the system. 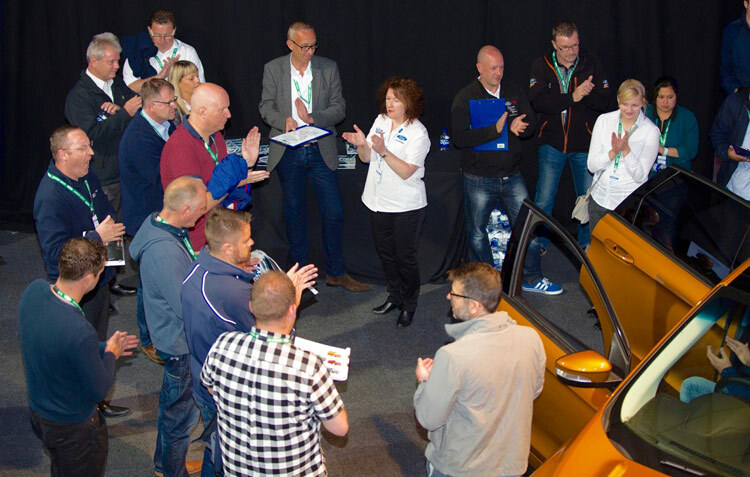 The ‘Urban Zone’ allowed delegates to learn how to operate and demonstrate driver assistance technology, such as advanced park assist, in a safe environment. They discussed with our technical guru, Stuart Jones how they could demonstrate this type of aid to their customers. Secondly, delegates had a thrilling drive around the legendary alpine hill route at Millbrook, but there were no James Bond Casino Royale style rollovers for us, due to James Pickford and the rest of the team who guided delegates safely around this challenging route, whilst explaining and demonstrating the luxury driving features of the vehicle. 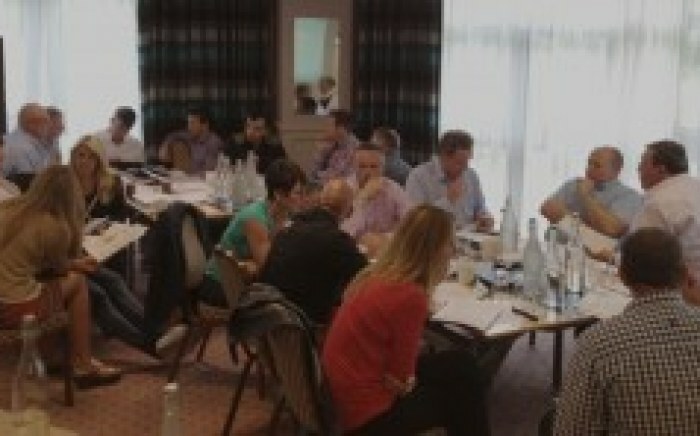 So some truly amazing and different sessions but that was not all that was in store for the delegates during the day. Anyone who attended ‘Ford Live’ will never forget their visits to the ‘Technology Tunnels’. Here we created a mysterious maze-like environment, which delegates negotiated via torchlight. Along the way, they encountered interactive exhibits and films, designed to enhance their knowledge of the technology within the new Ford Edge. Sophie Fisher and Tom Lloyd were on hand to assist the participants in their self-discovery. It was clear that the delegates were experiencing something they had never done before and very quickly they embraced this different learning experience, not quite sure what was round the corner. Surely something as normal as lunch could not have a ‘Unlearn’ feel to it? You bet it could! 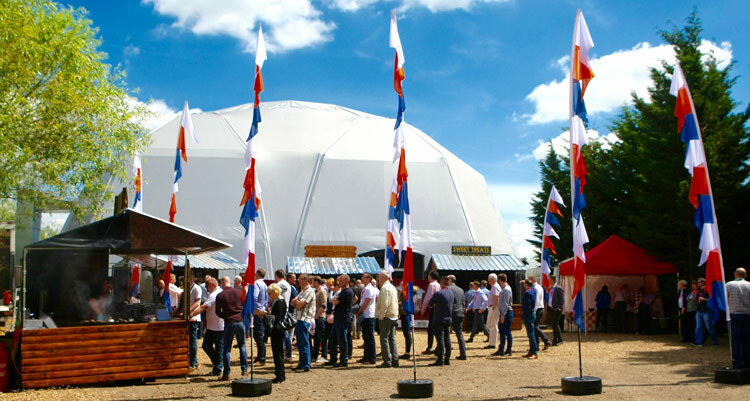 There was a feast in store for our attendees as they were led into the festival-like atmosphere of the Conifer Village and a spectacular array of Street Food stalls that they could visit until they were fit to burst! 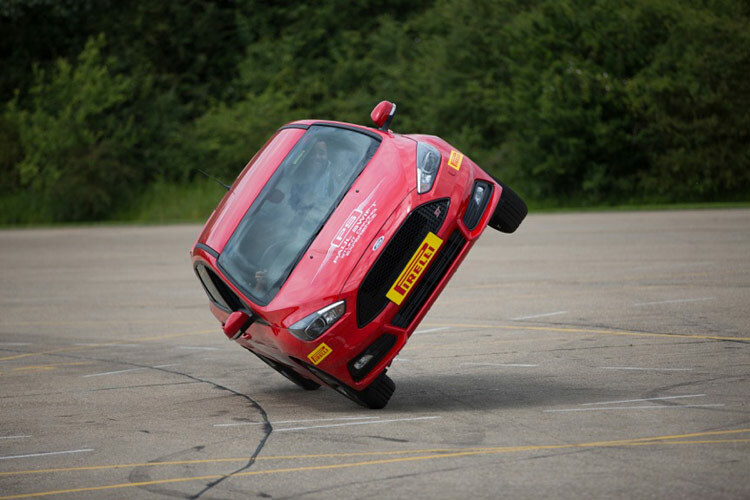 But lunch was also a visual feast for our delegates as they were treated to an amazing live stunt show from the brilliant Paul Swift (put a Focus on two wheels? Why not!). All in all, an event with a difference. We were confident we had delivered, but it was not for us to judge. What did the delegates and Ford think? 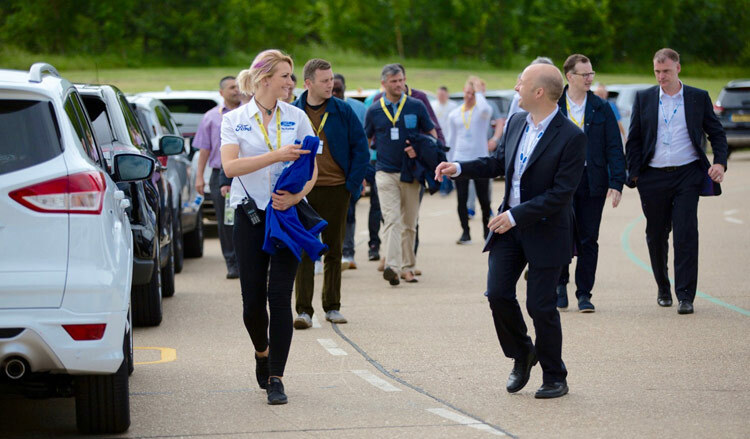 There was a huge amount of anecdotal feedback received for this first Ford Live event, including comments such as ‘best event in 20 years’, which is of course a huge credit to the entire team for making an event so enjoyable, exciting and successful. 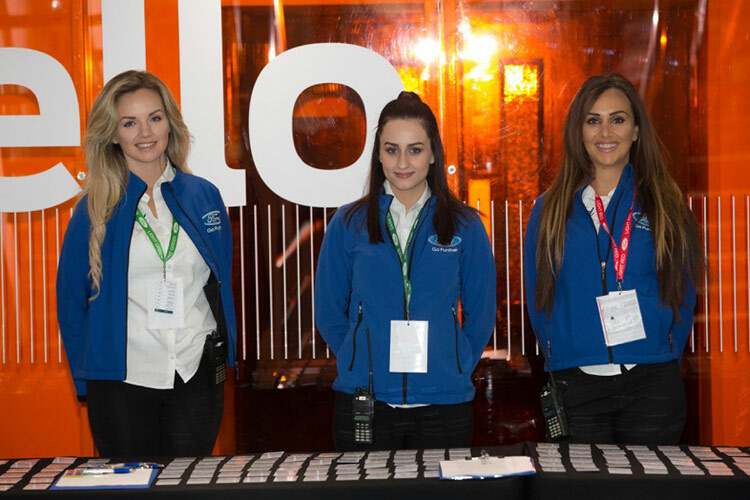 “Motiv8 delivered a memorable and effective event by successfully combining faultless logistics, a creative approach to delegate learning and infectious enthusiasm across the whole team. The result was a launch training event, which far exceeded the brief of launching a new vehicle by facilitating discovery and learning in an entertaining environment. Dealer sales colleagues left the event with a detailed knowledge and positive attitude towards the New Ford Edge which has translated into a sales performance which is running at 112% of objective with profit and revenues above expectations”. A fantastic message to signify the brilliant job done on the first ‘Ford Live’ Event, a credit to everyone who was part of the team. We look forward to continuing this success on the next one!